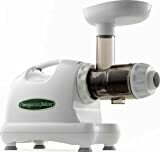 Multipurpose Juicer, also great for basic food processing. 220Volts, and hence not suitable for use in the USA unless you have a converter. 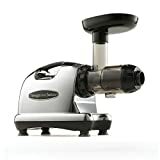 Omega juicers are the top masticating juicers in the market, and the omega 8224 single gear masticating juicer is our top pick. 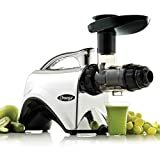 This is a simple single gear masticating juicer which operates on a low 80RPM speed, suitable for juicing a wide variety of fruits and veggies, such as wheatgrass and leafy greens. A portable juicer with dimensions of 8 x 2.3 x 2.3 inches which makes it one of the best juicers for home use, occupying little space. You will be amazed at the warranty on this product – it has a product warranty of 15years. Do be aware however that if you do not have a 220V supply, it certainly will not work, but if you live in the US and have a converter, then you will be fine. The omega 8224 juicer is also a multi-function type, capable of grinding spices and coffee, turning nuts into nut butter and making pasta strings.